NEXT | BlizzCon 2017: What is the Heart of Azeroth? In addition to going free to play, StarCraft 2 announced yesterday that we’re getting a new Co-Op Commander for Co-Op Missions. The twist being that this time it’s actually two people: Mira Han and Matt Horner. This somewhat squabbling couple are married, although Horner isn’t entirely sure if they should be. He met Mira while playing in a high stakes poker game that he won before entirely determining what the pot was — and it turned out that by winning the game, he ended up winning her. They’ve been together in a certain strange way ever since, although Matt often does take extremely long trips away from his “wife.” The dialogue between the two characters is the reason they’re being added together, as their dynamic is entertaining. In terms of what they do, Han is built around her mercenary forces, while Horner is a Terran Dominion commander and is based around those units. For example, Call in the Fleet is an ultimate ability from Horner that sweeps an area with a Fleet’s combined precise fire, while Han’s Spacestation Re-allocation teleports a space station into your target, annihilating it. This plays to Horner’s strength as a fleet commander and Han’s strength as a mercenary who does just about anything to win. 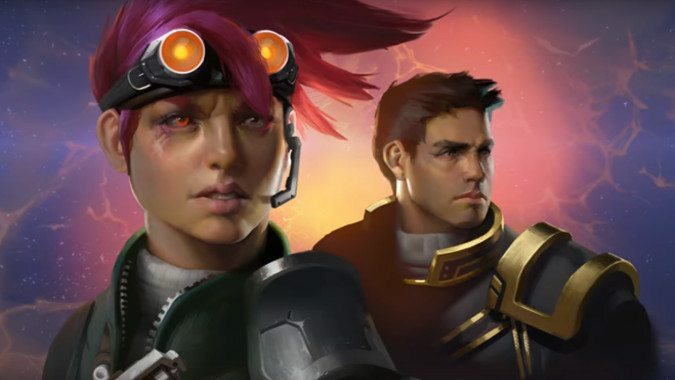 These two commanders in one bring a different dynamic than any previous Co-Op choice, and shake up the existing gameplay, including the ability to choose between their two different ultimate abilities. It should be interesting to see how players make use of their different abilities in matches.